This post contains affiliate links. Thank you for supporting STC in such a tangible way. Many of you have probably read at least one of the books in the What to Expect series. From prenatal nutrition to childhood development, this series is the go-to resource of many parents when it comes to…well, what to expect! Here’s my version…the cold, hard, wonderful facts about what you can really expect with kids. Who knows? Adjusting your expectations to the realities below might just save your sanity. Expect messes. Your kids will mess things up. They will ruin carpets. They will spill things. This is especially true if they’re wearing good clothes. And even more so if said clothes are white. Oh, and by the way, kids are not respecters of having guests, being guests, or eating in restaurants. If anything, expect more messes in these circumstances. Expect delays. When you have somewhere to be, you’re not going to get out the door quickly. Ever. Someone will need his shoes tied, someone else can’t find her coat, a third someone needs help combing his hair, and just when you’re finally heading to the car you’ll realize the baby has pooped. When you actually get everyone in the car, you’ll realize that your preschooler is either still in her nightgown or has her shoes on backwards, and the baby’s pacifier is still in her crib. Do yourself a favor and plan to leave twenty minutes before you actually have to leave. No, fifteen is not enough. Trust me on this one. Expect interruptions. Your kids expect your attention to revolve around them. And maybe that’s annoying and certainly, they should gently be trained out of that tendency as they mature. But with that being said, I kind of wonder whether our kids’ tendency to interrupt is just another way God is teaching us that our life isn’t our own. So stop setting yourself up for frustration by trying to accomplish tasks requiring a lot of attention when you’re surrounded by kids. Jobs like lesson planning and bill paying (and blogging…ahem) should probably wait until the kids are asleep or otherwise occupied. If you make the attempt, be prepared for them to interrupt. Constantly. And mostly about very unimportant things. Expect sleeplessness. ATTENTION, FIRST-TIME PARENTS: Do NOT be fooled when your infant sleeps through the night for the first time when she is two weeks old. She is faking you out. This will never happen again. Okay, so maybe it will happen again eventually. But she will probably not do it again for a long, long time. And guess what? There are dozens of things that will interrupt your sleep even when your kids are toddlers, preschoolers, and big kids. Nightmares, coughing, bedwetting, vomiting, fear of the dark, early waking, time changes, and heart-to-heart conversations are just a few things that often interfere with my getting a full night’s sleep. Yes, I said often. Expect the needs to be endless. I can’t even count the number of times I’ve finally gotten everyone’s food and drinks on the table, before finally sitting down to eat…only to have a child ask for seconds. Or how many times I’ve changed a baby’s diaper only to have him promptly refill it. Or how many times I’ve finished preschool activities and second grade Math/Language and sixth grade Grammar, only to realize that we still have group Science and History yet to complete…not to mention helping the public-schooled kids with their homework. I’ve been going at this for eleven years, and there’s no end in sight yet. Expect to love in ways you never even knew were possible. There’s something special about parental love. There just is. In a way that’s hard to describe as you’re experiencing it, and hard to imagine when you’re not. 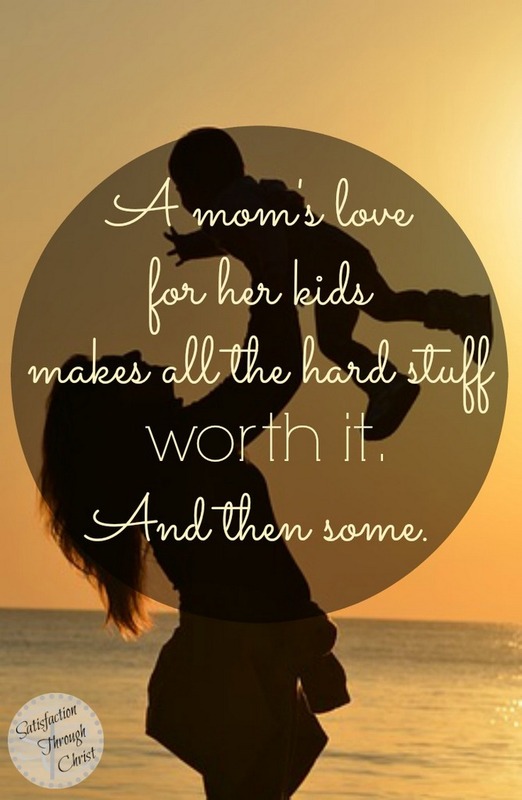 Thankfully, it’s the kind of love that makes all of the hard stuff worth it. And then some. Expect God’s grace to be enough. God always equips us to do what He calls us to do. Always. He doesn’t usually give us what we need ahead of time. And He doesn’t usually give more than we need. It’s really a moment-by-moment-by-the-skin-of-my-teeth-so-there’s-no-way-I-take-the-credit kind of equipping. Because just as with every calling God places on our lives, His purpose is His glory. Did you catch that? You and I have the truly awesome privilege of magnifying our God through our motherhood. Sometimes that means happy warm-and-fuzzies for us, and sometimes it means painful stretching-and-growing. But it always, always means true fulfillment and abiding joy as I see more of Him through it all. Now it’s your turn! What would your What to Expect manual include? I’d love for you to share some advice for your fellow moms by leaving a comment below! This post is one of the best ones I’ve read about motherhood. Congratulations! You know, it really is about responsibility in a very loving way. Hi, Cecilia! Thanks so much for your kind words! 🙂 I’m so glad this post rang true for you. Thanks for stopping by, and for taking the time to get in touch!